Welcome to the 4th Sunday of Advent. If you are like me, by now you have heard enough homilies about Christmas, so...with this in mind I have decided that today I will not preach about Christmas but about another topic we hardly get a chance to preach about: Manhood. But not the sinless, divine manhood our Lord Jesus displayed while he dwelt among us. I have decided to preach about the more common manhood we encounter in everyday life. A manhood that is flawed, weak and sinful, but that sometimes, when it is willing to trust and abandon itself completely to God’s providence, is capable of greatness. First we meet King Ahaz, a descendant of King David, a man who was proud and weak, who did everything in his power to destroy the Jewish religion, to the point of allowing pagan altars and pagan sacrifices in the Jewish temple. He was such a bad King that when he died, his own Son, Hezekiah, refused to bury him among the other kings of Israel. In today’s reading we see the hypocrisy of this man, who while allowing sacrifices to pagan gods in the Jewish temple, refuses God’s gracious offering of a sign. Ahaz shows us the wrong kind of manhood. A manhood which is based on the abuses of its own power. A manhood which, while refusing God’s gracious gifts, thinks that he can impress God with false shows of religious fervor. In contrast to Ahaz we meet Joseph, another descendant of David, but not a king, a humble carpenter. Here is this man who just discovered that the woman he is “betrothed” to marry is pregnant with a child that is not his own. And after struggling with what to do decided what every good man of his times would, divorce his wife quietly so as not to bring shame to her. And now according to an angel the father of the child is the Holy Spirit, the child will be a boy, even his name has already been selected: His name will be Jesus. Everything is already taken care of; All Joseph had to do was sign here on the dotted line. I’m not trying to be disrespectful to poor Joseph, but I’m sure in his mind he had all his life planned and then... this! What does a good man do in situations like this? A real man trusts in God’s providence, and embraces the task given to him. 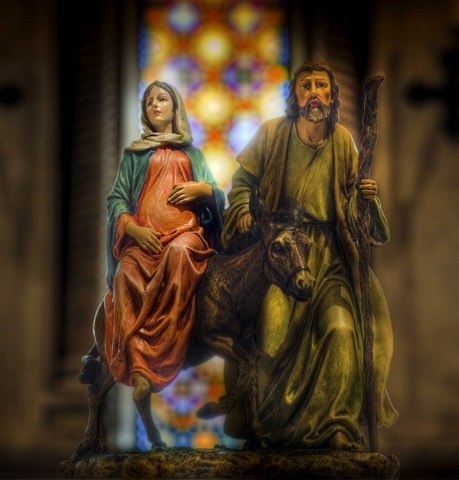 Joseph, presented with the awesome responsibility to be a father to the savior of the world, be his protector and his provider welcomes Mary into his home. Now your average person would think, “ok, since all this is God’s doing, from here on it is going to be easy sailing”; well the fact is that just about everything that could possibly go wrong went wrong! Instead of security and comfort, Joseph finds himself on a hard journey during the last stage of Mary’s pregnancy. Then when Mary was ready to deliver the baby he could not find a place to stay, with no family or friends to help. So he has to settle for a filthy manger surrounded by animals. And after the baby is born he is forced to uproot his family and escape to Egypt and become what we today would consider an immigrant. But this is not the way good men think. What does a man do when things are not going the way he planned?He maintains his trust in God’s providence. In today’s readings there is a great contrast between these two men, but there is something else: King Ahaz had lost his faith in the God of Israel and placed his trust in foreign gods; Joseph on the other hand placed his trust in God alone and the harder the way got the harder he trusted in God’s providence. This my brothers and sisters is the mark of true manhood: trust in God. In a culture in which the idea of manhood had been diluted to a point in which we are not too sure what real manhood is, we are given a quiet man. Not a King in command of great armies but a peasant with a simple faith and steady hand. God’s chosen father for his only begotten son. After the events of Christmas, Joseph retires into obscurity and we never hear what happened to him, all we know is that he did his job the best way he could and that he trusted that God will take care of the rest. I can not think of a better example of manhood for us here today. God bless your all.